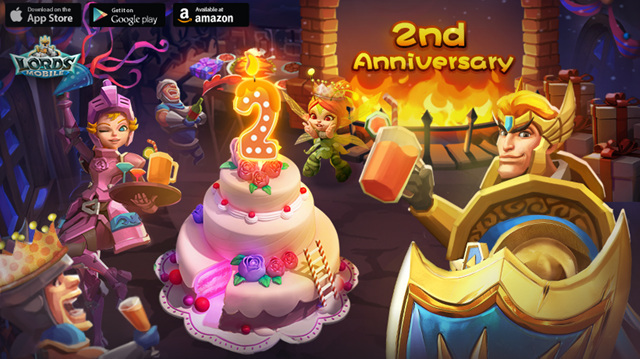 Lords Mobile Event Preview: Let’s Celebrate Lords Mobile 2nd Birthday! Can you believe it's already been TWO years?! It feels like we went online only yesterday! Let's celebrate this milestone together! Complete Hell Events and your guild will get the Anniversary Gift, which is filled to the brim with Gems and Guild Coins. Goblins and Gemming Gremlins are crashing the party! Catch these troublemakers to get their stash of Gold and Gems! They will appear every 3 hours. It's our birthday, but you will get the presents! Log in during the event to get a slice of our Birthday Cake. And that's not all: The Goddess Athena is feeling generous and has filled our lands with Gem Lodes. You know what to do!